Now that we’ve talked about where to focus on reaching out to your ideal clients, we need to talk about when. We need a plan. How often should you be posting content? What types of things should you think about posting? And where are you going to find time to do it? That is usually the big sticking point for most people. They understand the importance of doing some sort of marketing, and they’re willing to give it a shot. But it gets overwhelming trying to squeeze one more task into the day, or trying to plan out something they’ve never really done before. Do you feel that way too? My suggestion is to create a content calendar you can work from. If you’re super organized and love checklists and calendars, you’ll probably love this! And even if you’re not, you’ll probably still find this totally manageable (and hey, if you get stuck, I may be able to help!). Before you even start, you need to think about how often you want to be creating content. My suggestion is to start with once per day on social media platforms, or once per week with blog posts or newsletters. Try that for a couple of months and then make adjustments if you need to. And remember, we’re only choosing one or two mediums right now, not all the social media platforms and blog posts and newsletters and everything else. Step one: Think about your ideal clients. What kinds of things would they like to hear from you, and what kinds of things would you like to share with them? Ideally, you should be mixing posts directly about your business (such as suggesting they book an appointment with you) with posts that are relevant but not directly related (such as that interesting article about runners you saw the other day, that you know many of your clients will find interesting too). Each month you can start with the list from the previous month, and change things as you need. The idea is to have something to work from so you aren’t starting from zero each time. Step two: Take a look at the month ahead. Are there obvious things you can post about, such as holidays or events you’ll be holding or attending? Another thing you can look at is the various ‘awareness days’ and ‘social media days’ you see people mentioning on social media or in the news. For example, October 10th was World Mental Health Day. Here’s a link to a list of those for the remainder of 2017 (scroll down for the list). If any of those are relevant to what you do, or would just be fun to post about (hey, who doesn’t like National Donut Day, right? ), make note of them. Add those holidays, events, and other items to your content calendar. Step three: Go back to the list we made in step one. Are any of those items you need to post about on specific days or times? For example, if you prefer to let people know about available appointments every Monday, then put ‘Openings this week’ on the calendar for every Monday. For the rest of the items, decide how often you’d like to post about them. An easy way to start is to figure out how many days you need to fill on your calendar and then split it up evenly between the remaining topics. You can then adjust this each month, based on any feedback from your clients. Did they like certain topics and weren’t really into others? No problem, adjust as needed! Step four: Fill the rest of the content calendar. In whatever order feels good to you, put a topic on each day you don’t already have a post planned. Keep going until every day in the calendar has something on it and you’ve got a nice mix of topics throughout the month. But wait… what if you plan to create content on two different schedules? Say, for example, you plan to use Facebook daily and also do an email newsletter each week. What then? Here’s the easy way: Use your daily plan for your Facebook posts. Take each week and use the topics from that week to create your newsletter content. Note that the newsletter shouldn’t just be a cut & paste from your Facebook page! But you can certainly reuse topics or things you’ve linked to. The same idea applies if you’re using any of the other platforms. That’s it! 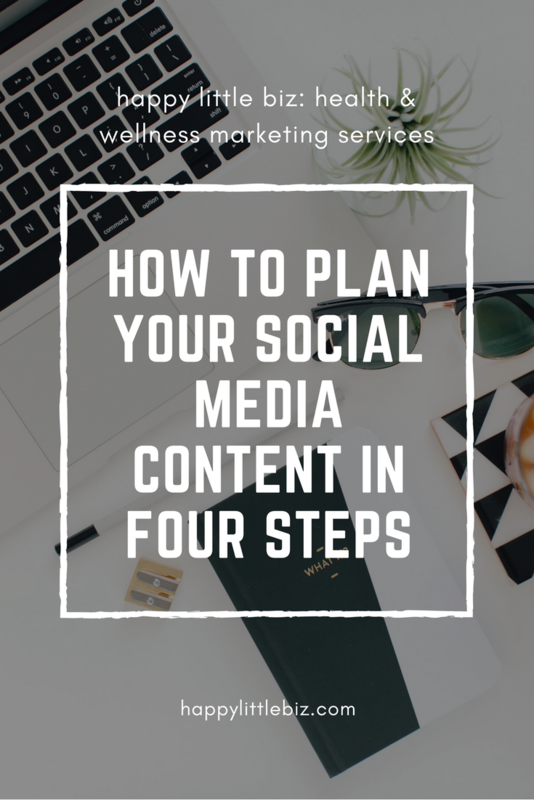 You now have a plan for an entire month of marketing content. Instead of staring at the screen wondering where to start, you’ve got an organized calendar to work from. Previous Post: « Are you feeling bad about marketing?